At Dover Park Hospice, every patient will receive relief and respite from distressing physical and psychological symptoms and issues, especially in the last phase of life when care at home is not possible. Patient activities are conducted by our Dover Park Hospice Volunteers. Our volunteers will organise a birthday celebration on the first Saturday of each month for patients whose birthdays fall on that month. Hair-cutting service is available free by our volunteers on a weekly basis. Celebrations will be organised for festivals such as Lunar New Year, Hari Raya and Christmas etc. Patients can look out for notices around the hospice on these activities and celebrations. Our volunteers will bring selected patients who are medically stable to visit places of interest e.g. Sentosa, Botanic Gardens, Changi Airport every Thursday morning, between 9.00 am – 12.00 pm. Family members who wish to accompany the patients are requested to inform the nursing staff ahead of the outing date. Trained volunteers come in every Saturday, at 4pm, to provide massage services to patients who are suitable to undergo massages. 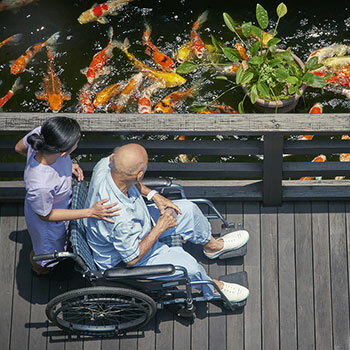 Dover Park Hospice maintains the garden and koi pond for the patients’ and family members’ enjoyment. Visitors and patients are requested not to release fish or tortoise etc into the koi pond. If you want to feed the koi, you may approach our Security Desk opposite the Administration Office for a packet of fish food. Visitors should inform our nursing staff if they require assistance to transfer the patient to a wheelchair to bring them around the premises. The two Multi-purpose rooms on Level 2 are for use by patients and their families. Multi-purpose Room 2 serves as a pantry, with a microwave oven and hot/cold water dispenser. Please help keep the rooms clean at all times. The Quiet Room on Level 2 is designed for reflection, meditation or prayer. Children below 12 years of age must be accompanied by an adult at all times. The Music Room on Level 1 is used for therapy sessions or events and functions. Patients and their family may use it when it is not occupied. There is also a library corner for use. Portable DVD players, movie titles and books are available for loan to patients. Please request these items from the nursing staff. Since February 2011, we have started our 24-hour homecare service to help patients with advanced illnesses receive care in their homes. 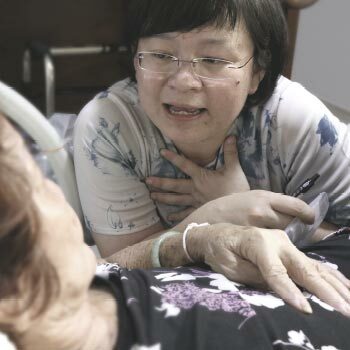 We accept referrals from Tan Tock Seng Hospital and continue to care for patients discharged home from our hospice. • A multidisciplinary team of nurses, doctors and medical social workers who provide physical, psychosocial and spiritual support. • In 2014, we launched Program Dignity under our Home Care service. This patient-centric initiative provides palliative home care for advanced dementia patients to live out their remaining days with dignity. • Dover Park Homecare accepts referrals from Tan Tock Seng Hospital within designated areas within the central part of Singapore. All referrals can be made by doctors caring for the patients via Agency for Integrated Care portal. Upon acceptance of referrals, calls will be made to patients and families to explain the service and to arrange for home visits. In 2014, we launched Programme Dignity under our Home Care service. 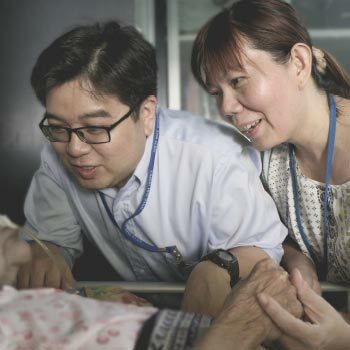 A collaboration between Temasek Cares, Tan Tock Seng Hospital, the Agency for Integrated Care, and Dover Park Hospice, this special patient-centric initiative provides palliative home care for advanced dementia patients to live out their remaining days with dignity. Recognising that many of them are suffering in silence with inadequate care at home, Dover Park Hospice established a specialised Advanced Dementia Palliative Home Care Team comprising a resident physician, consulting geriatrician/palliative physician, nurse clinician, and a medical social worker. This team supports persons with dementia and their families with scheduled home visits and further addresses their needs through phone calls and round-the-clock assistance.